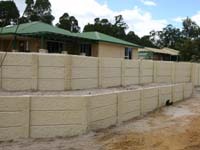 Bunbury retaining walls components consist of concrete post and panels, all steel reinforced. The 'H' shaped posts are set into holes dug approximately 113cm apart. The depth of the holes must equal the height of the retaining wall required (max depth 1200mm). Walls up to 1.5m high can be constructed. Equal pressures are then created above and below ground level (a cantilever effect). The posts are then aligned, levelled and anchored in a concrete footing. The panels are then inserted into and down the tracks of the posts. 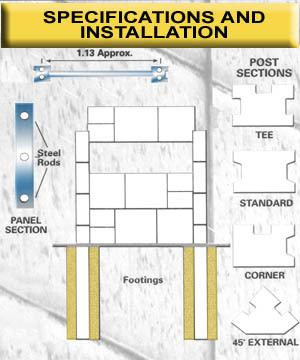 The bottom panels are supported by the footing around each post. Each panel interlocks and raises the height of the wall in 150mm increments.